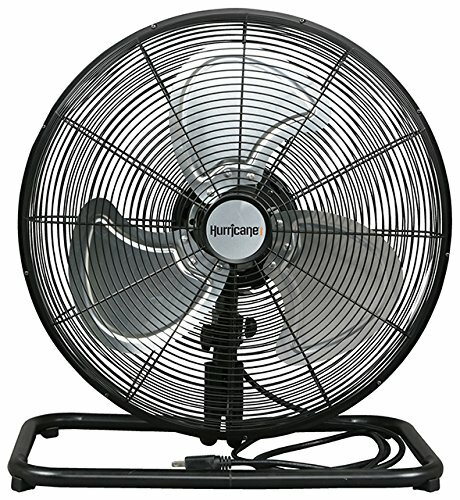 Hurricane Pro 18 in High Velocity Metal Oscillating Floor Fan is made for lots of air movement. With a 180 degree side to side oscillation, tilting head and sturdy base, this fan is perfect for those hard to reach places. is ideal for home, greenhouses, garages, workshops and other areas that may need a heavy duty portable floor fan. This fan is made rugged with all metal construction and a black powder coated finish. The fan blades are aluminum. This fan has 3 speed settings and adjustable tilt. Comes with a 6 foot 120 volt power cord. If you have any questions about this product by Hurricane, contact us by completing and submitting the form below. If you are looking for a specif part number, please include it with your message.